El pasado sábado 24 un grupo de músicos y admiradores de Arsenio Rodríguez realizaron una romería a la tumba del recordado "Ciego Maravilloso", con motivo de la conmemoración del centenario de su nacimiento. La actividad fue organizada por José Raphael Méndez y Henry Medina y entre los asistentes estuvieron Larry Harlow, Chocolate Armenteros, Tito Gonzalez y Aurora Flores. Aunque Ustedes no lo crean, la tumba del legendario músico cubano, que se encuentra en el Cementerio Ferncliff en Hartsdale, New York, no tiene una lápida que la identifique. Por tal motivo, este grupo de personas tiene como objetivo colocar la lápida faltante en la tumba y proponer que una calle de New York lleve el nombre de Arsenio. Arsenio Rodríguez was the original mambo king, one of the inventors of that genre as well as of the music that later came to be known as salsa. But no tombstone marks his grave at the Ferncliff Cemetery in Westchester County, and with the centennial of his birth having arrived, a group of his admirers have begun a campaign both to remedy that lapse and to get a street named for him in New York City. Born in a rural part of Cuba’s Matanzas province on Aug. 30, 1911, Rodríguez was blinded at the age of 7 when he was kicked in the head by a horse, but by 1940 he had nonetheless become a popular bandleader in Havana. He first came to New York City around 1947, hoping to have surgery that would restore his sight and spent most of the rest of his life in the United States, dying in Los Angeles on Dec. 30, 1970. Rodríguez wrote more than 200 songs, many of which continue to be performed by salsa bands the world over, thanks to their intricate African-derived rhythms and clever, often amusing lyrics loaded with double meanings. But he also was a skilled guitarist and percussionist and created the template for the modern salsa orchestra by emphasizing percussion and brass elements in his groups, a formula that other bandleaders like Pérez Prado, Tito Puente and Tito Rodríguez later copied or extended. Mr. Harlow will be part of a group that plans to gather on Saturday at 2 p.m. at the Rodríguez gravesite, in Hartsdale, N.Y., to pay homage to “The Blind Marvel,” as Rodríguez was often billed at his nightclub and concert performances. The ceremony was originally scheduled for late last month but had to be postponed because of Hurricane Irene, and the effort to give him a tombstone faces significant obstacles, legal and otherwise, according to Ralph Mendez, one of the organizers of the campaign, and David F. García, a biographer of the musician. When Rodríguez died, at 59, of complications of a stroke and diabetes, he was staying with a brother named Rafael, who was prepared to bury him in Los Angeles. But his common-law wife, Anadina, intervened, demanding he be buried in New York, and Rafael, irritated, declined to give her money for a tombstone, they said. 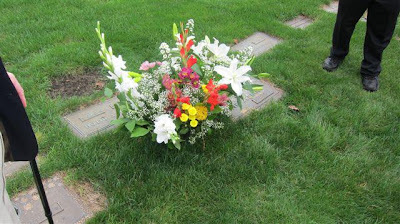 At the burial, she solicited contributions for a gravestone, which led to stories that Rodríguez had died penniless, which was not the case. But in order to install a tombstone, admirers of Rodríguez’s music need the authorization of his heirs, Mr. Mendez said, which has been difficult to obtain: a daughter is known to live in Cuba, and thus far it has not been possible to track down descendants of Anadina Rodríguez. The campaign to name a New York City street for Rodríguez may face fewer obstacles, given his strong ties to the city. At various times he lived in the Bronx and Spanish Harlem, and he celebrated both areas in hit songs like “La Gente del Bronx” (“The Folks in the Bronx”) and “Como Se Goza en El Barrio” (“What a Good Time They Have in the Barrio”), which he often played in shows for the Cuban, Puerto Rican and Dominican audiences that flocked to see him at social clubs in those areas. Malcolm X, Paul Robeson and James Baldwin are also buried at Ferncliff, and in some respects, Rodríguez was a kind of kindred spirit to them. The grandson of slaves brought from the Congo, he emphasized black pride in the lyrics of songs like “Yo Naci de Africa” (“I Was Born of Africa”) and played an important role in steering Cuban popular music away from the more restrained, European-influenced danzón style by proudly embracing African rhythms.